Sitting in an open bay surrounded by hills, Kuta, Lombok, is a sleepy backpacker town that is rapidly turning into a popular tourist destination. With surf beaches, nice cafes and restaurants there are plenty of things to do in Kuta Lombok to keep you entertained on your holiday. To help you make the most of your trip to Lombok I’ve created a list of 11 things to do in Kuta. It covers the best tourist attractions in the South of Lombok. Let’s get started with this guide of things to do in Kuta Lombok! The whole of Kuta faces out towards the sea and the mile long stretch of Kuta Lombok Beach. Restaurants and bars with thatched roofs line the edge of the beach. I wouldn’t recommend swimming or sunbathing at Kuta Beach in Lombok, as there are several nicer beaches within a short drive of the town. However, Kuta Lombok Beach is a picturesque setting for a meal or a beer at sunset. In the tenth calendar month of the Sasak Calendar the Bau Nyale Festival is held. The festival is based around the local legend of Princess Mandalika. According to the legend the princess was supposed to marry a prince from one of the local kingdoms. However, realising that choosing a husband would cause a war she decided to kill herself. During the Nyale Festival locals collect sea worms, which are believed to be the incarnation of the hair of Princess Mandalika. 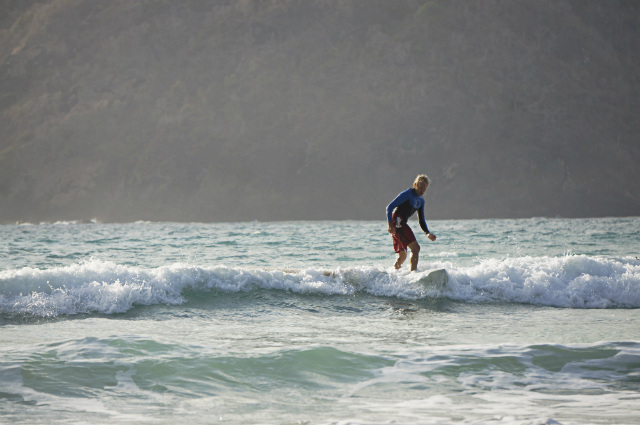 Learning how to surf is a popular past time for tourists who come to visit Lombok. Selong Belanak Beach is a picture postcard tropical getaway. Selong Belanak Beach is located in a half moon bay with a thick strip of golden sand that stretches as far as the horizon. Coconut trees and sun loungers line the edge of the beach. You can buy fresh coconuts and rent surfboards from the small stalls that line the edge of the beach. It is one of the most popular Lombok surf beaches. Tanjung Aan is the legendary resting place of Princess Mandalika. The beach faces the Indian Ocean and stretches along the coastline for a total of 2km. The sand is a mixture of black and white grains giving the beach a distinctive pepper-like appearance. There are also reefs just offshore where you can do some snorkelling. A few years ago the beach used to be deserted, but it has become increasingly popular with tourists. The view overlooking Kuta, Lombok, from the patio of Ashtari Cafe. Nothing beats the view from Ashtari. 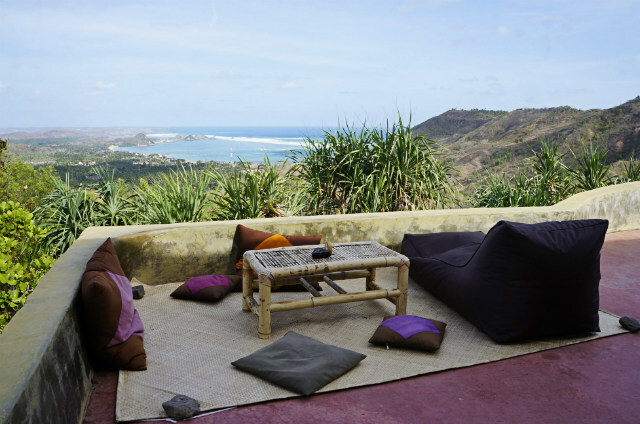 The cafe is located up on the hill above Kuta with panoramic views over the bay. The cafe is the perfect place to chill out, play games or just read a book. If you feel active you can join a yoga class, which are held throughout the day on the patio. Cooking classes are also held twice a day, from 10am-noon and 1-3pm. This is a great way to learn to cook some Indonesian dishes using ingredients from the cafe’s organic garden. In the evening you can enjoy tea time with desserts while reading a book or just chat with your friends and catch the sunset. The cafe is open every day of the week between 6.30 am – 6.30 pm. Dusun Rambitan is a traditional Sasak village. The traditional homes in Dusun Rambitan are made of thatch and bamboo. You can also see examples of the distinctive rice barns, known as Lumbung in the Sasak language. Dusun Rambitan is also famous for its woven fabric, which is still produced by hand. You can see some examples of different designs from Lombok in the photo below. 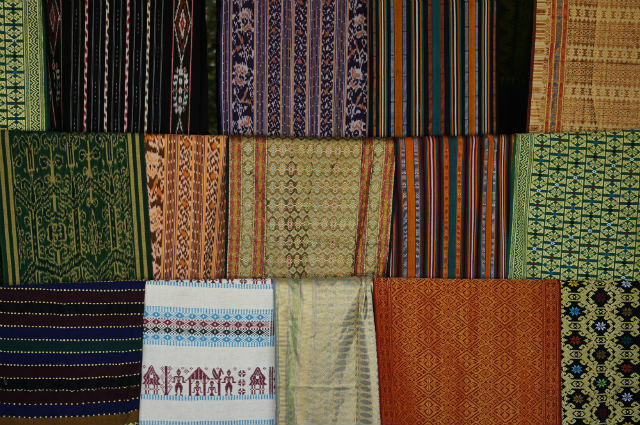 Traditional hand woven fabrics being sold in Lombok. You can see a range of designs in these examples. Dusun Sade is the second traditional Sasak Village that is located close to Kuta. Like Dusun Rambitan the village is built in the traditional Sasak style. Out of the two villages Dusun Sade is the more interesting to visit as there is more to see in the village. The shops in Dusun Sade have a large range of woven fabrics as well as necklaces, bracelets, jewellery boxes, and many more accessories. If you pay attention you’ll notice many designs incorporate a lizard motif; this is because lizards symbolise fortune in Sasak culture. A one-hour drive from Kuta there is the village of Sukarare/Sukarara, which is famous for its weaving. The people in the village display the cloth that they produce in front of the houses. All of the cloth produced here is handwoven using local designs. The people in Sukarara are happy to explain more about the motifs and the function of the fabrics that they sell. A word of warning, the fabrics sold here are not cheap! The countryside outside of the main town of Kuta, Lombok. As you can see the area is very dry. If you can drive a motorbike, rent it! The rental price is Rp. 50,000 per day. Driving around Kuta is easy, there is a lot to see and the landscape can be beautiful, though it is definitely dry. As you drive around you will see a lot of tobacco fields as well as the illegal gold mines, which are unfortunately all too common. Also keep an eye out for the bulls that will wander slowly across the road in front of you. Like the famous Pink Beach in the Komodo Islands, the Pink Beach in Lombok is famous for the sand, which comes from the pink coral. Besides the striking colour of the sand the Pink Beach is a great place to relax, snorkel and even do some kayaking. Make sure to check if it’s the jellyfish season before you jump in, because the jellyfish aren’t friendly and they do sting. The Pink Beach in Lombok has a distinctive colour as a result of the red coral sand. Kuta in Lombok is a convenient base for exploring the south of Lombok. I hope that this list showed you that there are lots of great things to do in Kuta Lombok. With beautiful beaches, great cafes and interesting villages there are plenty of opportunities to create great holiday memories. I hope you enjoy your time in Lombok and that this list gave you some valuable inspiration. Have you visited Kuta Lombok? What would you recommend to people visiting the area for the first time? Share your thoughts in the comments below. We just got back from Lombok as well, but we went to the quiet Sekotong instead of Kuta. Would love to go there next time! Yes you should. I bet you will love Ashtari. Komen dari Kakak Ganteng. 🙂 Iya, enak leyeh-leyeh di sana sambil main Uno. We group of friends are visiting Bali from 29th Sep onwards for 5 Nights. Can you help us what all places we can visit. We are staying 3N in Legian & yet to book 2N stay, thinking for Jati Homestay after reading your blog. Also since we are group of friends, more of adventure & nightlife people, so if you can guide accordingly will be really helpful. Thanks in advance. Jati homestay is located in Ubud. There are not too many things happening in Ubud at night. If you (and your friends) want to find the best nightlife then you should stay around the South of Bali like Kuta, Seminyak, Canggu, etc. Hope it helps. Saya lahir di praya, waktu kecil sering kuta, saat itu benar2 belum terjamah. Oh ya coba datang saat bau nyale, pasti dapet sensasi berbeda. Motorbike is Rp 50,000 per day, and usually can be cheaper if you rent for long term. yaah tahun lalu udah ke sana tapi ashtari terlewati 🙁 sayang sekali..
I’ll send info through email. Speak soon. Hi .. I’m coming for a girls trip to Lombok and we intend to stay in Kuta Lombok.. can I have info on the activities in Kuta?? Like diving , snorkeling etc? There are some dive center/shops around Kuta. I have never been diving around the area so I don’t have any recommendations. As for snorkeling, I think you can do it in Tanjung Aan Beach. Hope you have a great time in Indonesia. We love your blog and we have followed it to visit kuta lombok. We also visited the following restaurants and they were amazing and we think it is worth adding them to your list. Hi James! Thanks for the kind message. Yes I’ve been to El Bazar and it is nice. I really need to go to Kuta area again to update some of these infos. Thank you and I’ll update it soon!